I often take a break from my work here at my home office to walk back in my woods. I call them mine because of the amount of time I’ve spent working back there, even though they technically belong to the county. I’ve blazed a walking and mountain-bike trail through the woods, complete with log jumps, ramps, and other adventures. I routinely maintain the trail and the woods, cleaning up garbage, removing log jams in the creek, and sawing and removing downed trees that block the path. I’ve thought about this as I’ve worked in my woods. God created it all and controls it all. But part of his design was to give us stewardship over what is his—to manage it and work alongside him in caring for it. Sometimes as I remove large branches that impede the flow of the creek, I can immediately see a difference in the direction of the water. This might sound silly, but I seek to be in tune with God enough to sense how I can best work together with him to tend to these woods. After all, they don’t belong to me or the county. They’re his, but I am his partner. Jesus was the perfect example of a good steward. It is obvious in the Gospels that he lived his life on Earth as a steward of all God gave him. Of particular interest is how he illustrated stewardship of the small group entrusted to his care. Seven times in John 17:6-19, Jesus referred to the disciples as being his, given to him by the Father while he was here on Earth. He discussed what he came to do: to pass on to them what the Father had given him (vv. 8, 13, 14). He talked about multiplication—that he was leaving them behind and that he was sending them into the world just as he had been sent (vv. 11, 18). Jesus’ attitude about his small group is reflected in his summation: “None has been lost except the one doomed to destruction” (v. 12). Not only had they not been lost, but they won thousands to Christ just a few weeks later and started a movement that changed the world. That never would have happened if it had not been for Jesus’ attitude of stewardship as he surrendered his will to God’s eternal purpose (see Ephesians 3:11). God has a great, eternal purpose for your small group, too. It will be accomplished when you surrender to it as an act of stewardship. Jesus modeled stewardship for us, and he also spent a lot of time speaking about it. We generally apply Jesus’ teachings on stewardship to money, but that’s just a small part of the picture. God wants you to wisely manage everything he gives you. In the parable of the talents in Matthew 25:14-30, Jesus gave a number of guidelines for how you can lead your group as an act of stewardship. “A man going on a journey … called his servants and entrusted his wealth to them” (Matthew 25:14). You have been called to lead something that does not belong to you. It belongs to the Master who has entrusted you, the servant, with the responsibility to invest into your group members while they are in your care. As the group shepherd, you have been given a huge trust, responsibility, and privilege. As our main passage puts it: “Be shepherds of God’s flock that is under your care” (1 Peter 5:2). 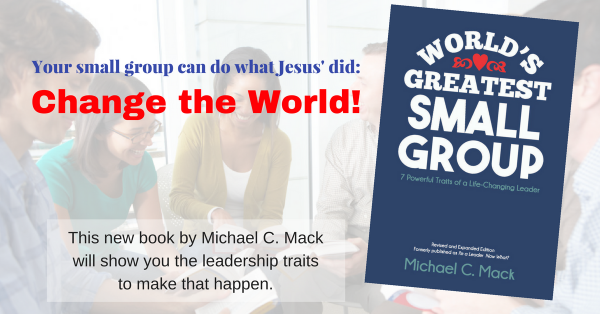 As a small group leader, God has entrusted you with much! He’s entrusted you with his men and women, his message, and his mission! I’ve discussed being a steward of his people and his mission, but what about his message? The apostle Paul sent this warning to the Galatian leaders: “Let me be blunt: If one of us—even if an angel from heaven! —were to preach something other than what we preached originally, let him be cursed” (Galatians 1:8, The Message). This statement is so important, Paul repeated it a second time: “I said it once; I’ll say it again: If anyone, regardless of reputation or credentials, preaches something other than what you received originally, let him be cursed” (v. 9). “Let the word of Christ dwell in you richly as you teach and admonish one another with all wisdom” (Colossians 3:16, emphasis added). “You must teach what is in accord with sound doctrine” (Titus 2:1, emphasis added). The reason Scripture cautions us about sound teaching is obvious. We are handling the truth. Anyone who leads or teaches any kind of group has a high privilege and responsibility. This does not mean, however, that leaders and teachers must be exceptionally talented, highly educated individuals. The apostles were known as “unschooled, ordinary men” (Acts 4:13). As you lead, you are responsible not only for the group God has given you and his mission, but to correctly handle the word of truth (2 Timothy 2:15).